Schools are getting out for the summer! It’s time to get out, relax, and enjoy some family fun! There are so many fun things that the whole family can enjoy right here in Ross County. To download your own copy of the summer bucket list just click the link. Have you ev er been to a Chillicothe Paints Baseball game? It’s great for the entire family. Cheer on our local team and enjoy the night. Most home games they even have special events. Maybe you like to get outdoors? Enjoy a walk or hike at one of Ross County’s State Parks or maybe try to get to all five of them this summer. We also have a beautiful national park, Hopewell Culture National Historic Park where you can walk through the gorgeous earthworks! Like kayaking? Head down Paint Creek it’s so much fun. Do you have little ones in your family? Enjoy the playground at Yoctangee Park and pack your lunch for a picnic! There are many picnic areas and shelter houses inside of Yoctangee Park. When you finish up with lunch have a nature scavenger hunt! Of course don’t miss out on Chillicothe’s history during summer break! Visit Adena Mansion & Gardens, the home of Thomas Worthington. View the home and walk the gorgeous grounds. Another great place to stop this summer is the Ross County Heritage Center! There is so much to learn there. People of all ages can enjoy! 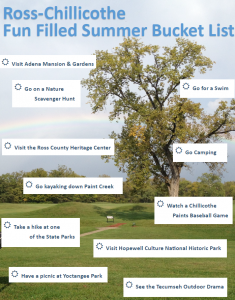 These are just a few of the things that Ross County & Chillicothe have to offer this summer. For more information please check out our “What to Do” tab, and check out our event calendar.